On a sunny day in August 1980 200 women from 27 countries lined up in Battersea Park in London to run a marathon. It was the first time the city’s streets had ever been closed for a race. It was the 3rd August. Two days before the men’s marathon had taken place at the Moscow Olympics. But there was no women’s marathon in the Olympic programme. Women’s distance running was not recognised by the world’s greatest sporting event. The furthest distance women could compete at in the Olympics was 1500m. This distance had been included for the first time for women eight years before at the 1972 Munich Olympics. The London women’s marathon was the third in a series of marathons sponsored by the Avon cosmetics company. The Avon International Running Circuit was the brainchild of Kathrine Switzer. Avon took her on in 1977 to manage their rising stars women’s tennis circuit, and she successfully made the case for the company to sponsor a marathon race for women. The first Avon International Marathon took place in Atlanta, Georgia, in March 1978. It was the starting point for the development of the Avon International Running Circuit. Over its eight years of existence it gave over a million women the chance to run a range of distances. Many of the women were competing for the first time. Twenty-seven countries hosted over 200 events. Switzer enlisted the help of local running clubs to plan the route and organise the race. She had plenty of experience of working with running clubs and race organisers in the United States and their participation was undoubtedly critical to the success of the race. In her book she mentions Bryan Smith (Barnet & District AC), who was Race Director, Paul Lovell (Highgate Harriers), Dave Billington and Vera Duerdin. Sir Horace Cutler, Leader of the Greater London Council (GLC), gave his permission and his active backing to ensure that the race could happen. I have not been able to find full details of the route but Switzer describes it starting at Battersea Park, going over Westminster Bridge, through the Isle of Dogs, with the finish at Guildhall in the City of London. Some of the 200 competitors had won their places through accumulating enough points in shorter races in the Avon Running Circuit series, or as prizes in other races. Others were elite athletes who were invited to run. These included Joan Benoit and Gail Volk from the US, and Lorraine Moller from New Zealand. An Avon representative was selected to run, Jean Britton from Essex. In an article from The Guardian’s Women’s Page published the day before the race, Britton says that she had only started training two months before when she had heard about the race. Her ambition was to run at least 13 miles. I have not been able to find a complete results list, but a partial list on the Association of Road Racing Statisticians website states that 155 runners completed the marathon. In addition to the US, UK and New Zealand, it lists competitors from 12 countries: Canada, Brazil, Australia, Japan, Belgium, France, Germany, Italy, Luxembourg, Spain, Sweden and Switzerland. One of the favourites on the day was Joyce Smith, the British record-holder, who was coached by her husband Bryan, the Race Director. Smith had won the second Avon International Women’s Marathon in Waldniel, Germany, the previous year. However, Kathrine Switzer notes in her book, “Marathon Woman”, that Smith had only just recovered from catching chicken pox from her daughter and was probably not on her best form that day. The New Zealander Lorraine Moller won the race in 2:32:44, having passed the race leader, American Nancy Conz, at 21 miles in the Isle of Dogs. Moller was a track athlete who had started distance running after moving to the United States in 1978. Nancy Conz finished second and Canadian Linda Staudt took third place, having overtaken Joan Benoit close to the end of the race. Joyce Smith was the first British finisher in seventh place. I’ve not been able to find out whether Jean Britton made it to the end of the race. William Scott, a member of my running club, was a spectator on the day. William started running around this time, and thinks he may have read about the race in an athletics magazine or in the press. He cycled with his neighbour from his home in Highbury to Guildhall to watch the finish. They saw a lot of the finishers, including the winners. William told me it wasn’t at all busy at the finish. There were only about 40 people there, and he thought most of them were the organisers. William and his neighbour were able to stand next to the course with their bikes to see the runners come past. He told me that his impression at the time was that these were all top class competitors, “the idea of ordinary people running marathons didn’t exist back then”. William went on to run many marathons himself, with his first one being in June 1981. Smith, Adams and Gould took the first three AAA Championship places. Leslie Watson took first place in the Championship the following year, when Rugby was chosen as the nominated event. March 1981 saw the inaugural London Marathon as we know it today. The official programme for the event lists the top 30 UK women’s marathon times in 1980 with the 14 fastest running under 3 hours. I imagine that many of these women competed in the Avon marathon. By the time of the Avon International Women’s Marathon in London, a campaign for the inclusion of the women’s marathon in the Olympics had been going on for several years. The marathon grew in popularity as a racing distance in the 1970s in both the US and the UK, with the birth of mass participation events, such as the New York Marathon which started in 1970. New York, unlike most other marathons, included women as competitors from the start. The Boston Marathon, one of the oldest marathons in the world, finally admitted women runners in 1972 after a campaign by Bobbi Gibb, Kathrine Switzer and many other women who wanted the right to compete at the distance. This growing public interest in the marathon coincided with the women’s liberation movement. To many people it started to seem ridiculous to limit the distance women could run in competition to just 1.5 miles, because of fears about the effect of the exertion on women’s health. There were two main initiatives involved in bringing about the inclusion of the women’s marathon in the Olympics. In 1979 two-times marathon world record-holder Jacqueline Hansen formed the International Runners Committee with other runners from around the world. The committee was supported by Nike, a fledgling shoe brand at the time. Their aim was to lobby the International Association of Athletics Federations (IAAF) and International Olympics Committee (IOC) for the inclusion of women’s long-distance races in international competition. They made the case for the 3,000 metres, 5,000 metres and 10,000 metre track races as well as the marathon. None of these distances were included in the Olympics at that time. The second initiative was Switzer’s work setting up the Avon International Running Circuit. For a new women’s event to be included in the Olympics, the IOC’s rules stated that it had to be widely practised in at least 25 countries and on at least two continents. Switzer’s aim was to provide the evidence that this was the case by staging races in many different countries, and by providing a route for women runners to compete in an international marathon event. Joan Benoit won the first women’s Olympic marathon, in the third fastest time ever run by a woman. The International Runners Committee continued to campaign for the inclusion of the other distances. The 10,000 metres was run for the first time in Seoul in 1988 and the 5,000 metres replaced the 3,000 metres in Atlanta in 1996. I would love to hear from anyone with more information about this race. Do you know who the other British competitors were, or which other countries were represented? Were you there on the day? Read my articles about Kathrine Switzer, Joyce Smith and Jacqueline Hansen. The main source for this article is Marathon Woman by Kathrine Switzer, Da Capo Press, 2009. “The fight to establish the women’s race“, chapter from The Olympic Marathon, by Charles C. Lovett, 1997. Reproduced on marathonguide.com. The banner photograph and the Westminster Bridge photograph are by Arthur Klonsky. I am not sure if the banner photograph is from the London race or another of Avon’s marathons. The photograph of Joyce Smith is from an article in the Watford Observer. I love that book, Katie. Great piece. I wrote a piece for Women’s Running in which I interviewed a woman who ran the first London marathon (not the Avon one). It’s astonishing that women were not allowed to run more than 10k until the 1970s because of bogus fears about their wombs dropping out. The head of the IOC’s most inflammatory quote around the 1960s was that women had no place inside the Olympic Stadium, unless they were there to crown the winning men with their laurels…. Thank you Ronnie. 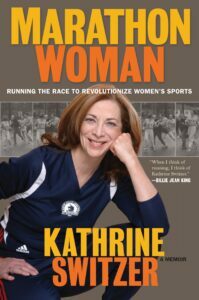 There is so much of interest in Kathrine Switzer’s book, that I decided to focus on that race and see how much I could find out about it. Women in the UK today have so many opportunities to run that we could easily take it for granted, and I think that remembering the struggle to get here is really important. I’m also interested in finding out more about women’s experiences of athletics and sport, growing up in a time when women’s participation was either very limited or not allowed.